Home page > The 2009 trip	> Preparing the trip	>Meeting-debate "Taayoush"
Starting from the idea of Taayoush, which in Arabic means « living together», the Halles of Schaerbeek (Brussels) offered on October 28, 2008 a moment of reflection on the social, human and political stakes of the Israeli-Palestinian conflict, a debate on decolonisation, plural identities inside a same territory and social justice, and a discussion on the impact of the media on the construction of our western imagination as well as on the potential repercussions of the conflict in our Belgian society. Sitting around the table were two distinguished experts on the question, both field activists and over-the-wall go-betweens, Leila Shahid and Michel Warschawski, together with Francis Maertens who has worked on the anthropology of Judaism, racism and anti-Semitism. Moderator : Hocine Ouazraf, a Belgian sociologist who has written a book on the influence of the conflict on life here, in Brussels, Belgium. H. Ouazraf introduced the different guests as well as the questions that were going to be debated. Before handing over the debate, he indicated that the Israeli-Palestinian conflict is not so much a conflict between two communities as a conflict between several Jewish and Arab-Muslim communities. It is the thermometer of the good health of our society, he said. Leila Shahid is an anthropologist. She studied at Beyrouth American University, which is one of the historical pockets of the Palestinian political contestation. 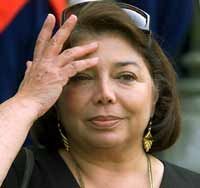 In 1978, she married the Moroccan writer Mohammed Berrada and settled with him in Morocco. In 1987, she started writing for the Palestinian Studies review. 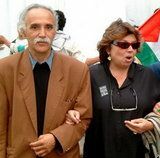 Before she was appointed to the post of General Delegate of Palestine in France (from 1994 to 2005), Leila Shahid had been for three years head of the Information Bureau of the Organisation for the Liberation of Palestine (OLP) in The Hague. 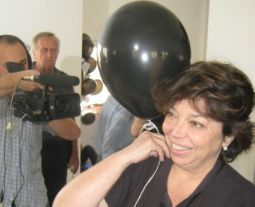 Since November 2005, she has been the Ambassador of Palestine to the European Union, Belgium and Luxembourg. Leila Shahid (whom Hocine Ouazraf introduced as the « passionaria of justice in the world ») took the floor first : "I am indeed totally opposed to reducing the conflict to a community problem. In France, where I worked for 9 years, it is the press that says that the suburbia Arab communities identify with the Palestinians and use the opportunity to attack the Jewish communities. For the great majority of the citizens of the world, she insisted, the matter that is at hand with the Palestinian resistance is a people’s liberation movement fighting for a democratic state. The Palestinian State recognizes, i.e. doesn’t try to destroy, the Israeli State. This is something people in Israel know today, thanks to the excellent work done by the new Israeli historians." “Today, information comes on our screens immediately, contrary to what happened in 1948 when the reality of the facts could be concealed or lied about and when, for instance, the Zionist idea of « a land without a people for a people without a land » could spread. Today, everybody knows what is going on in Palestine. Everybody knows that a people lived and still lives on this land and that it is being despoiled of it. Taking an interest in the Israeli-Palestinian conflict is a question of citizenship and doesn’t concern the Arab Muslims of Brussels only which, by the way, are not that much interested in the activities organized by the Mazarat festival, not even in this debate”, L. Shahid noticed. She looked seriously at the audience : " I would like you to understand that this complex issue of the Israeli-Palestinian conflicts finds its roots in your history and more precisely in the 40-45 war between France, Belgium… and Germany. The Jews of these countries, who often constituted an elite, had no reason to leave before WWII. It is only after the genocide that some people imagined to create the State of Israel. The Palestinians have learnt to recognize the legitimacy of a « promised land » as a compensation for what had happened in Europe. As for the Lebanese, Moroccan, Syrian… Jews, they are quite indifferent to the history of the European Jews : they have never been despoiled nor forced to wear the yellow star... In the Arab countries, just like in Europe before the war, the Jews often constituted the elite of the people. But they got frightened after the genocide and started dreaming too of a place that would be theirs only and in which they would be safe for ever. Now, not only did the emigration of all the Jews of the earth to their « promised land » contribute to the eradication of whole cultures (e.g. the Jewish Berbers’) but the Palestinians, who were dispossessed of their lands which were all redistributed to the Jewish newcomers, actually paid for you, Europeans, for the crime against humanity which the WWII genocide represents. Today, there is still much left unsaid on both sides, Israeli and Palestinian, and consequently much fear of the other. Europe’s present concern for Palestine, for example, is interpreted by the Jews (and some non-Jews) as another wave of hatred against them and thus as another threat. They think their status as Jews makes it their duty to see to it that what they had to suffer (deportation…) is never repeated, especially if it is due to Israel." Hocine Houazraf then asked Michel Warschawski about what makes the Israeli-Palestinian conflict universal. An emblematic figure of the Israeli Left and an anti-colonial militant, Michel Warschawski was born in 1949 in Strasbourg and has been fighting for peace and against the occupation of Palestine since he was 18. He is the co-founder of Yesh Gvoul, a movement of reservist soldiers during the war with Lebanon, and the founder of the Alternative Information Centre (AIC) against disinformation in Israel. He has been sentenced to prison several times. His book "On the Border" (Stock, 2002) owed him the 2002 Diplomatic World Prize. Not the “knowing better” type at all, Michel Warschawski shows via the story of his life that fighting against injustice, authoritarianism and segregation is essential to human dignity. Michel Warschawski lives in Jerusalem. Michel Warschawski answered that, indeed, the stakes of the conflict were those of our planet : "There is a global strategy, he said, a policy of re-colonisation of the world which is everybody’s business. For 50 years people have tried to codify the rights recognised to the different categories of human beings (women, children, linguistic communities …). However, we are attending a re-conquest of these rights now : the project or the neo-conservative strategy of America and Israel is to close a 50-year-long interlude again, put an end to this period of law and focus on the Israeli-Palestinian territories. And he added that "the Palestinian resistance (even if there is a certain demotion today) should be considered as the emblem of the resistances to this global colonisation. The evidence of it is that Palestine is at the heart of our period’s stakes and that not a day goes by without the media talking about it." Francis Maertens pitched in to say to us that there was no hierarchy in the Arabophobic, anti-Semitic, etc… behaviours. Francis Maertens is a psychologist, psycho-analyst and anthropologist. He is particularly interested in the anthropology of Judaism as well as of racism and anti-Semitism. He notably worked on the kashrout (normative religious rules in the field of diet) and on the universal basis of xenophobia and the scapegoat figure. 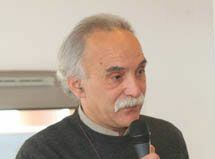 He contributed to the book in homage to Léon Poliakov: "Racism: myths and sciences" (Editions Complexe) and took an active part in the plea to vigilance some French intellectuals made a few years ago to warn the citizens against the trivialization of the negationistic speeches. "Today, in France for example, Francis Maertens said, all criticism against Israel is assimilated to anti-Semitism. Today, contrary to 1930, political correctness requires you to prove that you are not an anti-Semite. To have an idea of what ordinary anti-Semitism was in 1930, we must be aware of the change in content there is now : today, the paranoia crystallizes against the Arab world, and more especially since 09/11 (collapse of the Twin Towers in NY). There is no speaking of racism with a tremulous quaver in the voice, he said. Racism is a banal aspect of human life. Xenophobia, i.e. the fear of the foreigner is the attitude of preventive aggression people adopt so the other doesn’t fire first. Anti-Semitism is but the Christian form of xenophobia. Both are normal mechanisms : as soon as he goes beyond what he knows or is familiar with, the human being develops a certain fear of the other. We should in fact be on full alert all the time because if anti-Semitism is now still banned in the words, racism expresses itself (there are neo-Nazi groups in Israel). Indeed, a lot of people think that the Israeli Palestinian conflict and its effects (among others, the fear of terrorism) legitimises racism." Leila Shahid explained then that 2001 is the moment of shift between the before and after 09/11 : "A new form of terrorism was born. International relationships have changed : the bipolar system has vanished to give way to a violent power struggle. Afghanistan then Iraq have been destroyed and nobody has set up a Court to judge that. Chaos, which is now global on the military, political and financial levels, is the result of the ultra-liberal vision adopted by the Superpowers. Concerning the Israeli-Palestinian conflict, there is an obvious loss of the sense of responsibility on the part of the international political authorities as to the application of law : What is the European Union doing ? Why doesn’t the European Counsel take measures against the Israeli settlements while having nevertheless called them illegal ?" * The fact is that today Israel’s number one problem is the imbalance in the population growth on both sides. What is wanted is a Jewish State in which a certain percentage of Palestinians is tolerated but not beyond it : the Palestinian population must absolutely be contained… Just like in Yugoslavia - where the will was to re-compose the country according to ethnicity even if the state is the state of one community - all foreigners are felt to be a danger and the consequent tendency is to exclude, purge, eliminate the minority communities. We shouldn’t bury our heads in the sand and ignore that the common wish of the Israelis is that one day all the Palestinians disappear, yet without having to get their hands dirty (a good tsunami…). « The other » being seen as a « problem », the Israelis consider all the non–Europeans settling in Europe as invaders : in fact, the Israelis make an extreme right analysis of the immigration in Europe ! * * 60% of the Palestinian population live outside Palestine, i.e. 7 millions of refugees all over the world. They have different statutes depending on the country that hosts them : in Jordan, they have the same rights as the Jordanians; in Syria, they must have a « travel document » that gives them the same rights as the Syrians ; in Lebanon, a country built on denominational bases, their situation is terrible since posts are allocated according to religious adherence : there, the 400.000 Palestinian refugees are seen as invaders (« they want to settle on our lands ! » = paranoïa). The problem of the refugees, to whom Israel denies the right to return, is a fundamental trauma. * Being a victim doesn’t grant you any dignity, nor virtue nor any particular right except the right to recognition (and have what happened clearly named) and a right to compensation when it is a possible thing to do. The infernal cycle that turns yesterday’s victim into today’s torturer can only be stopped by the intervention of a third and authorized authority : International Law. * * The 18th century mythical Israel has nothing to do with the Israeli State that was created and which Israel legitimises with the Shoah. Israel has put itself under the UNO laws, recognizes the international law : the International Community must demand from Israel that it respects the given word as to the issue of the Palestinian refugees. * Of course there is a link between economy, precariousness and racism : as soon as my everyday economy is threatened, there is a racist reaction (the Shoah was born from the 1930 economic crisis). The same is true as soon as my identity is threatened (if the others’ habits spill over mine : where does he begin, where do I end ?). But the solution to the Israeli-Palestinian conflict is not economic : the Palestinians are not asking for bread but for independence, which is dignity. The pictures / maps / drawings marked with a star * have all been borrowed from the net. May their authors see no mischief in it!